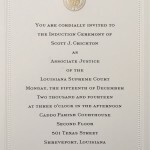 In just under an hour and with equal doses of piety, humor, humility and zeal, Scott Crichton doffed the robes of a Caddo District Court judge and donned those of the Louisiana Supreme Court. Elected without opposition in the fall elections, he was welcomed by his peers on the state’s loftiest bench and given a farewell by his fellow Caddo District Court brethren. Hundreds thronged Caddo District Court’s second floor. 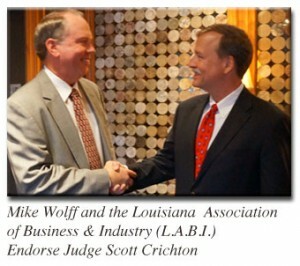 Professionals from all walks of life — from fellow judges and elected officials including district attorneys and their staffs from the 11 parishes Crichton now serves, to private attorneys, doctors and accountants — filled not only the large and sumptuous courtroom, but also several surrounding courtrooms. 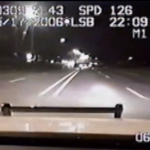 Their galleries, jury boxes and even the dockets for the accused, were full. 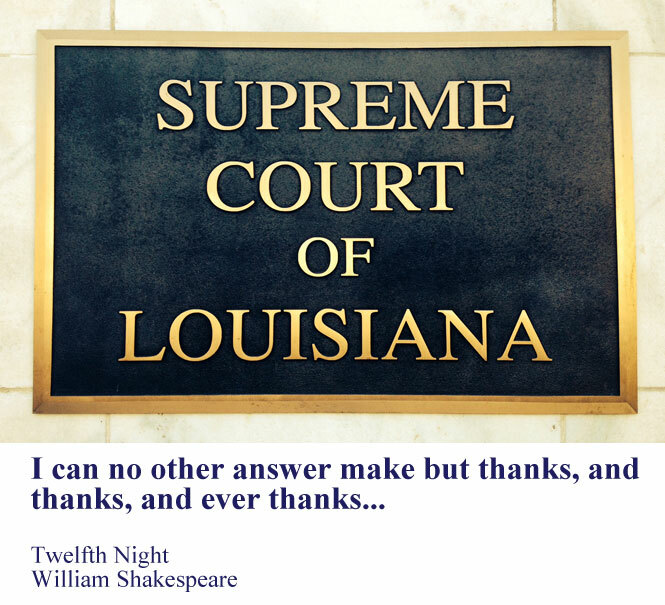 According to at least one speaker, it was only the third time in the Louisiana Supreme Court’s 201-year history that it has sat in Shreveport. 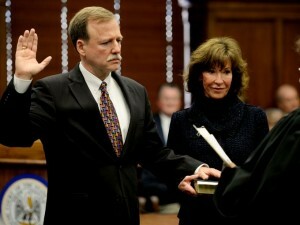 Crichton, 60, was sworn in by Chief Justice Bernette Joshua Johnson, with the assistance of his wife of three decades, Susie. His robing, just moments later, was done by his sons Stuart and Samuel, who followed their father into the practice of law. “I’ve never done this with help,” he quipped as his sons helped him into the raiments with an audible zipping noise. But those were the formalities. 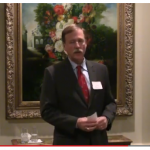 The depth of the moment was conveyed by Crichton in his remarks at the close of the ceremony, and through the humor and anecdotes of four friends he asked to speak before his life transformed from one affecting Caddo Parish to one affecting the entire state. 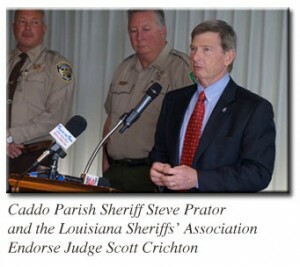 The most informal and off-the-cuff remarks were by Caddo Sheriff Steve Prator who, of course, told a lawyer joke. Prator shared the story of a fine hunting dog named “Lawyer” that impressed everyone with the ability to smoke out game. But the next time people saw the hound, he just sat in the blind and barked. 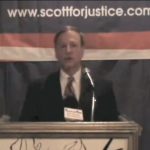 Late in their work as prosecutors, Stewart served as Crichton’s supervisor. “I always had comfort that I could turn him loose on the most serious and complicated cases and know that he would take care of it,” Stewart said. And, he noted, Crichton was unflappable, treating the accused with the dignity appropriate to the setting. 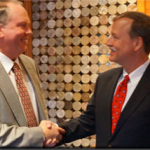 Once, O’Callaghan recalled, Crichton found himself on an elevator with a criminal defendant. 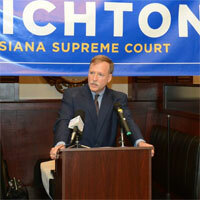 Larry Pettiette, president of the Shreveport Bar Association, the first of the four speakers, pointed out three strong suits of Crichton’s that he thought would serve well on the state’s highest court. He said what a hard worker Crichton was, illustrating with his attention to detail in writing opinions and moving his docket. 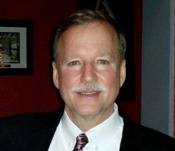 He then recalled a case where Crichton had taken the time to deny a temporary restraining order when an elderly witness it would have affected and likely impoverished could not understand it when harassed by an arrogant attorney. He closed by noting, as did most of the speakers, Crichton’s ceaseless, untiring presentations to middle school and high school students to forestall criminality on such subjects as “Electronic Crimes: Sexting, Texting and Beyond” and “Don’t Let This Be You.” These give impressionable youngsters a look at what it is really like to be arrested and have to deal with the law. 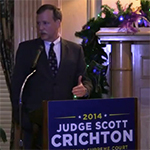 For his part, in final remarks Crichton thanked the District Court he was departing, God and his parents, as well as his wife, for making him the man and the judge that he is today. 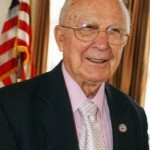 He especially thanked his parents, the late Thomas and Mary Crichton, for stressing the importance of education, which he said he took to heart. He said in the two years since he felt the call to run for the state office, he’s had a chance to visit the 11 parish his seat serves, and has met with people the law touches every day. 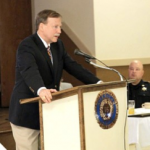 “The law often deals in abstractions and hypothetical situations, but the decisions that judges and justices make about the law have great consequences for the people whose lives are affected,” he said. “I pledge to remember my renewed appreciation for the real and practical consequences of the decisions I help make as I assume this great honor. “The Crichton family motto is ‘God Send Grace,’ and I have no doubt been blessed with abundant grace,” he said. 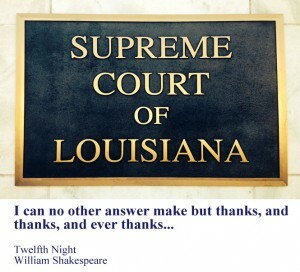 “And I live by the scripture, ‘For unto whomsoever much is given, of him shall be much required.’ Thus with this grace and blessings, including importantly, this position on the Supreme Court, comes obligation and responsibility to this state with dignity and honor. 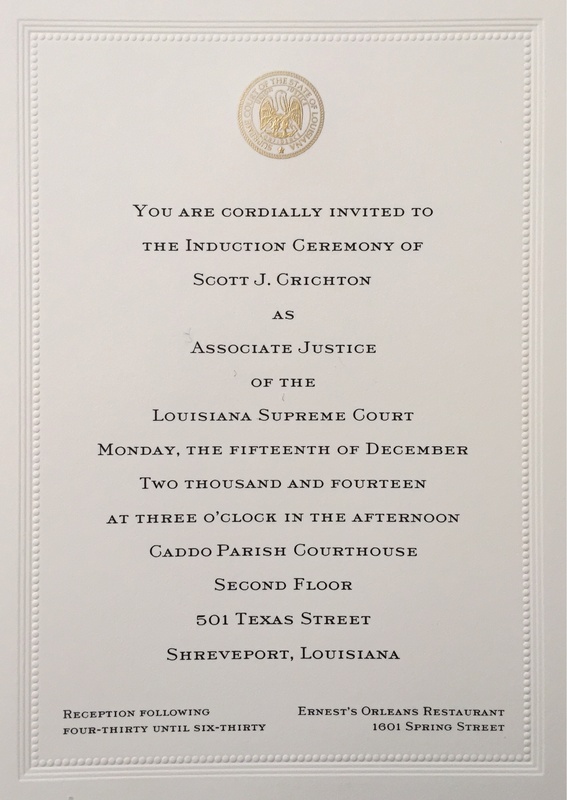 Louisiana Supreme Court Associate Justice Scott Crichton serves Judicial District 2, which includes Caddo, Bossier, Webster, DeSoto, Natchitoches, Red River, Sabine, Vernon, Allen, Beauregard and Evangeline parishes.